Kaeng Krachan National Park (KKNP) is Thailand’s largest national park, covering 2,900 km_ at the southern end of the Tenasserim Range on the border with Myanmar, and is part of a larger protected forest complex covering 4,373 km_. 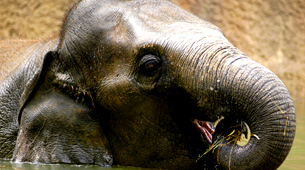 There are reasons to believe that KKNP contains a large and internationally significant population of Asian Elephants (Elephas maximus), but no population estimate is available for the park, and little is known about the distribution of elephants within the park or the threats to the elephants and their habitat. Lack of such vital baseline datasets hampers effective management of KKNP and its elephant population. 2. to identify threats to the elephant population and elephant habitat. One exception to the lack of data on KKNP’s elephants is human–elephant conflict (HEC), particularly crop raiding, which is known to be a major problem around KKNP. Human–elephant conflict leads to antagonistic attitudes towards protected areas and can lead to farmers poisoning or otherwise killing elephants. The second major aim of the project is therefore to work to reduce human–elephant conflict around KKNP, which will benefit both the local farmers and the park’s elephants. Farmers will be provided with information about new methods of reducing HEC that have proven successful elsewhere and a coordinated crop-guarding system at the demonstration sites (HEC ‘hotspots’) will be established and appropriate equipment provided. The lessons learnt in KKNP will also assist farmers reduce HEC elsewhere in Thailand and at other HEC ‘hotspots’ in Asia. In addition, the distribution of elephants and the threats to the elephants and their habitat have been mapped. Unfortunately, this work has shown that threats to wildlife and wildlife habitat are wide-spread within KKNP and poaching is rampant throughout KKNP, despite public impressions to the contrary. As a result, the third major aim will be to work with the Thai authorities to improve law enforcement in KKNP. This project is being implemented by the Wildlife Conservation Society and the Government of Thailand with support of the International Elephant Foundation and the United States Fish and Wildlife Service Asian Elephant Conservation Fund.